When I went up to Rochester for a wedding in October I didn’t make it to Nick Tahous, but I had been planning to make garbage plates at home for a long time. Today was the day. 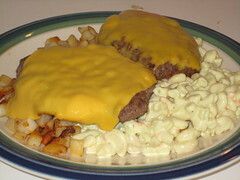 Behold, my attempt at a cheeseburger garbage plate inspired by the original. 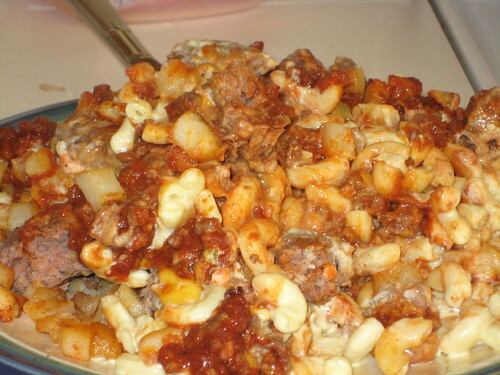 For those unfamiliar, it’s a delicious mix of macaroni salad, home fries, two cheeseburgers, topped with a spiced meat sauce. Technically speaking it’s a cheeseburger plate, mac-home fries sauce only. It would be a trivial matter to add the onions and mustard, though I have no idea about what sort of mustard they use at Nick’s. I admit that the meat sauce looks more like chili than I remember. So for those who have had their fair share of plates over the years, perhaps this will look more appropriate. 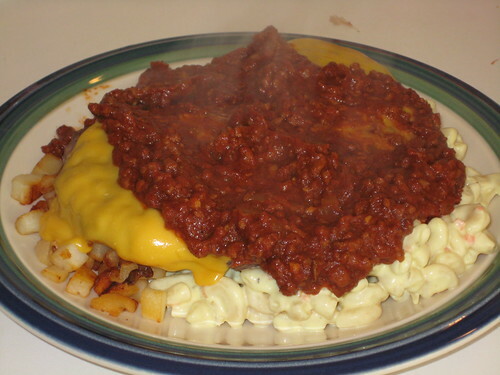 If you’ve never experienced a garbage plate, that photo isn’t likely to be appealing. The visual appeal of it is a phenomenon that’s difficult to explain. If you have had one before and don’t live within walking distance, I’m happy to report that the recipe below comes pretty damned close to the original. For the special sauce, I started with Damian Lynch’s recipe. I increased the garlic and substituted beer for water and went with a 12 ounce can of tomato paste, which eliminates the need for ketchup later. When I saw this list, I was stunned at the number of spices. It didn’t look like it would taste like I remember, and yet it creates this sweet and spicy taste that fits perfectly. What follows are Damien’s instructions, with my minor changes in italics. 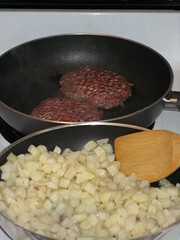 In large skillet, fry chopped onion and garlic in oil until soft. Add meat, stirring constantly with fork to keep its texture fine. Once the meat browns, add beer and tomato paste. Simmer 10 minutes. 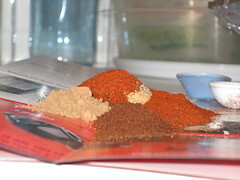 And sugar and spices. Simmer covered 30 minutes, adding 1 cup water to keep it moist but not soupy. The rest of the preparation is pretty straightforward. Cook up some cheeseburgers, using whatever ground beef you have. They don’t have to be top sirloin, the cheaper the better when it comes to authenticity. I used the pre-formed frozen bulk patties from the wholesale club. Grill or skillet, it doesn’t matter. Cook up some home fries. I used a bag from the freezer section at the grocery store. The potato chunks were smaller than the original but it was much more convenient. I used a pre-made macaroni salad from the grocery store deli, though if I were to make it from scratch I’m probably start with this recipe. I never remember the macaroni salad at Nick’s being stocked with vegetables, but I do remember the crunch of celery. When everything is ready, throw a hefty scoop of macaroni salad on a plate. Follow it up by a hefty scoop of home fries. Put two cheeseburgers on the top, then cover the whole thing with a ladle full of the sauce. Garnish with a slice or two of Italian bread. I prefer to cut everything up and mix it all together (hence the photo above), but everyone’s got a different idea about how to eat the things.